Even a Trade Show Samurai Master like myself is prone to mistakes. Last night I found myself at an event at the University of Chicago without a lead card. You might say it’s weird for someone to carry lead cards around with them, but you just never know when you will need them. I was forced to scribble notes on the back of business cards. Few business cards are designed to be written on. A lead card is the essential piece of Trade Show Samurai weaponry. Its value should never be underestimated. A good lead card will have an incredibly positive impact on your success at the show. It’s like a Samurai’s sword. Great care is taken by the guy who makes the sword. If you ever saw Kill Bill, Volume One by Quentin Tarantino you will know what I mean. There are three main parts to a good lead card labeled 1, 2 and 3 in the image. The first part captures contact information. This is fairly standard, but can vary a little from industry to industry. For instance, you may be at a consumer show and want to capture the names of a spouse or kids. I like to have a stapler handy so I can staple it to the card and not have to fill everything out. I still write down their name and number in case the business card falls off. 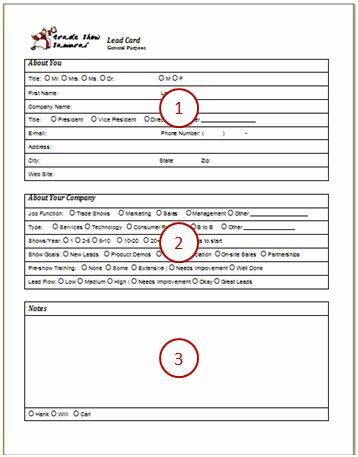 The second part of the lead card captures the characteristics that will help you later score or rank-order the lead for your sales department. It will also guide your conversation during the Art of Interrogation. This part is made up of primarily checkboxes. The less actual writing you do on the show floor the better. If you can check, check, check the boxes you can move fast, like a gazelle. The third part of the lead card is for capturing a few of your own sentiments. It consists mainly of a notes section and a few check boxes to indicate your overall vibe. I call the vibe check boxes Hank, Will and Carl. They are fictional salespeople that mean Hot, Warm and Cold. If someone is looking over your shoulder and sees you check “Cold” you may find yourself doing some uncomfortable and time-wasting explaining. Good lead cards capture just enough information to be useful and nothing else. They evolve after numerous conversations and debates with your team. Discussion, debate and rehearsal will perfect your lead card. Never overlook this step.